Okay, so the iPhone hasn't been officially announced yet. But! But that isn't stopping this eager retailer. According to Chinese site Sohu, this shop is getting the jump on everyone else by offering iPhone 5 pre-orders. The in-store display doesn't show the actual iPhone 5 (it looks to be an iPod Touch, rather), but that's not the point. 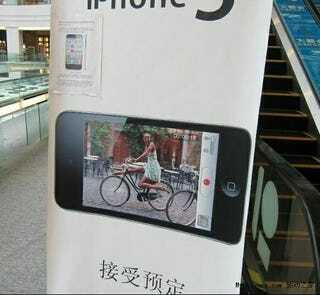 In iPhone crazy China, the retailer is aggressively doing what it can to get pre-orders prior to the iPhone 5's official unveiling. Pre-orders for pre-announcements! The future!